Universal Central Battery - Series CBL - Signtex Lighting Inc.
Supplies emergency power at 24VDC for 90 minutes to any combination of general lighting luminaires fitted with the Series ELC Emergency Lighting Control, MOONLITE LED emergency lighting fixtures, and exit signs. Up to eight 24V emergency branch circuits with wire size from #18AWG to #8AWG can be installed with 1-hour rated metal jacket type “MC” cable, per NEC 700.9 (d)(1). If required, loads may be rated for Class 2 wiring. Hard conduit Class 1 wiring is not required unless specified by local codes. 120 VAC standard input, optional 277, 347 or 480 VAC. 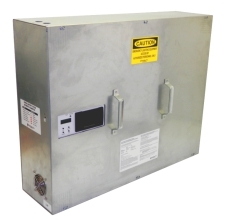 NEMA Type 1, UL 50 steel cabinet for surface or optional recess mount. 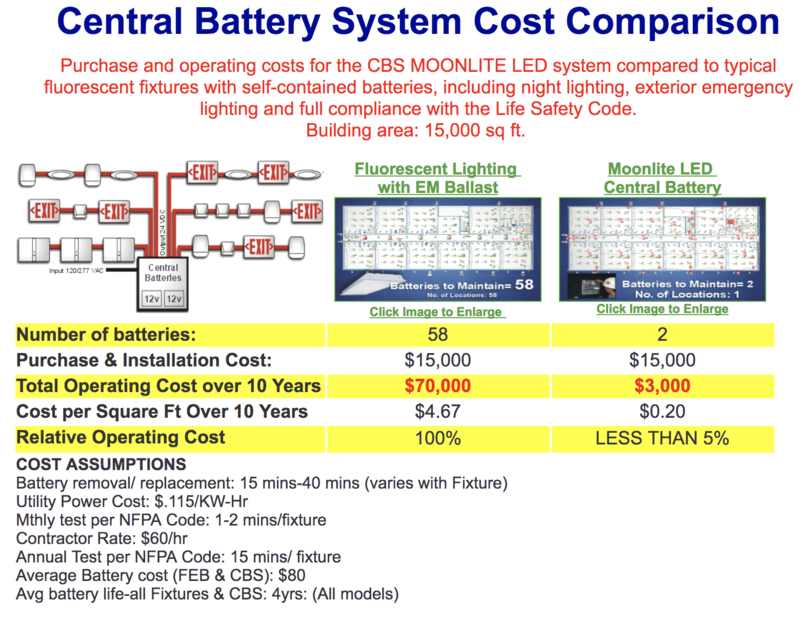 Four CBL models are offered to supply from 100 to 1,000 watts emergency power. Less than 25 watts power consumption in standby mode. Batteries are readily accessible for inspection and maintenance by facilities personnel, allowing timely replacement when indicated by the diagnostic system. 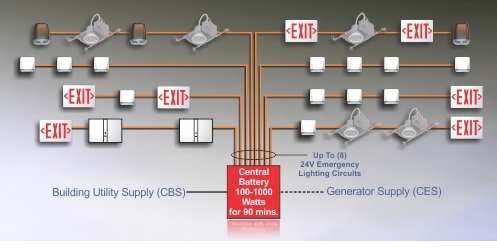 100 or more emergency lighting fixtures and exit signs may be connected to a single central battery panel. Optional installed printer will produce test reports on demand as required by NFPA 101, Paragraph 7.9.3.1.3 (5). Computer-based, self-test/self-diagnostic functions complywith NFPA Life Safety Code 101 (2012) Paragraph 7.9.3.1.3. Optional LCD display with diagnostic control center enables RT Clock to set start time for diagnostic testing as required, to avoid test activation of emergency lighting in dark areas or in sensitive areas when building is occupied. Displays show fault reports, battery charge, voltage and current load, battery temperature, and complete fault history. Optional installed printer enables easy compliance with LSC 101 Paragraph 7.9.3 for written reports. Any LCD display can be printed as required. Optional Branch Circuit Load Monitoring automatically reports current flow on 8 individual branch circuits, reducing troubleshooting of possible locations following a fault report (requires LCD option for display). Standard 24V charging system is computer controlled and optimizes current flow for maximum battery life. Optional fast charger recycles system from complete discharge to full capacity in less than 12 hrs. Listed under UL Standard 924, and meets applicable requirements of CSA C22.2 No. 141, NFPA 101 Para 7.9.3.1.3, and NEC 700.12 (c).